Many women experience a sudden onset of rapid hair loss two to four months after delivery. 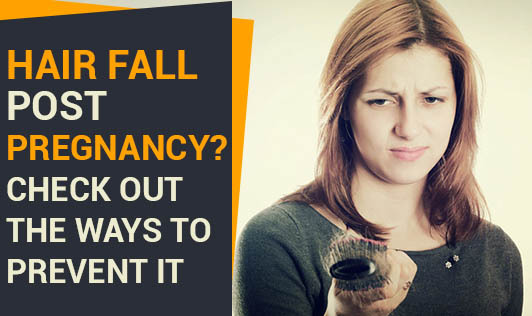 The main cause of hair loss after pregnancy is hormonal changes that a woman's body goes through. Eat a healthy well balanced diet, high in proteins, vitamins and minerals and anti oxidants like eggs, poultry, pulses, whole grams, fruits and vegetables. These can protect hair follicles and encourage hair growth. Avoid using fine toothed combs and heated blow dryers to your wet hair. Let it dry naturally. Select the right shampoo for your hair. You can get a suggestion from a dermatologist/ cosmetologist to use mild and quality ingredient shampoo. Avoid certain types of hair styling and styling combs. Any hair style can put extra stress on your hair that can cause it to fall out. Reduce stress- this can be an additional trigger for hair loss. Prepare yourself well ahead and this can help you avoid stressful situations across. Exercising regularly after a few months of pregnancy. This can help to boost energy that may help in hair growth. Stay hydrated with fluids like water (8-10 glasses/ day), juices etc. Talk to your doctor to make sure your hormones are balanced, thereby can help you reduce hair fall.